Keystone Canna Remedies is a family-owned dispensary that will begin dispensing medication in February. Keystone Canna Remedies is getting ready to accept new patients in February. NBC10's Steven Fisher got a sneak peek at Keystone's ribbon-cutting ceremony in the Lehigh Valley. Patients will walk into a spacious waiting room where security will check for proper identification and physician recommendations. Inside an adjoining area, patients can sit down with pharmacists in one of two private consultation rooms to discuss treatment options, ask questions and learn more about state regulations. With a plan in place, patients will then visit the retail counter to choose from dozens of medications. 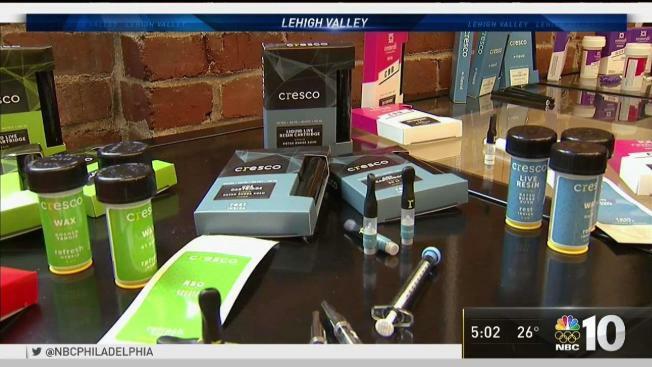 Flower and edibles will not be available per Pennsylvania law, but patients can purchase vaporizers, cartridges, tinctures, oils and even lotions. They can also choose between products that contain THC – the psychoactive ingredient that gets people buzzed – and CBD – a purely medicinal compound that does not produce a high. Native Brooklynites, the Guadagnino family chose Pennsylvania to kick off their cannabis business after seeing Gov. Tom Wolf’s commitment to getting the program off the ground quickly and without the kind of bureaucratic hiccups that plagued similar programs in New Jersey, Maryland and New York. The elder Guadagnino is a cardiologist whose own father found relief from cancer in medical cannabis. “It was very personal for all of us,” he said, adding that the family has a home in Bucks County and a business partner in the Lehigh Valley. Keystone Canna Remedies’ opening comes at a precarious time for the marijuana industry. Earlier this month, U.S. Attorney General Jeff Sessions rescinded an Obama-era directive that allowed states to decide their own marijuana laws. Cannabis remains a Schedule I drug alongside heroin and LSD at the federal level. Sessions’ move coincided with California becoming the nation’s largest state to welcome recreational use of marijuana at the beginning of the new year. California’s medical program has been in place since the mid-1990s. But the Guadagnino family is not worried their business could go belly up if prosecutors chose to enforce federal drug laws. Wolf has signaled a willingness to continue the state’s program despite Sessions warning, and U.S. Sen. Elizabeth Warren from Massachusetts introduced a bipartisan bill to protect state marijuana laws from federal scrutiny. One of those patients is former Philadelphia Flyers left winger and current Lehigh Valley resident Riley Cote, who uses medical pot to recover from years on the ice. Known as a brawler, Cote racked up more than 50 penalties during his time in Philadelphia. He often woke up swollen and bruised, and retired from the sport at the age of 28 after undergoing multiple surgeries. To manage the pain, doctors prescribed him pills. In cannabis, Cote found a sustainable and holistic approach to health. Keystone Canna Remedies is now open to the public for consultations and educational workshops only. The dispensary will begin selling medication in February.